Why Is Everyone So Worried About Being Tracy Flick? Madeleine Kunin, the first female governor of Vermont, blogs about her surprise at the way young women today are internalizing stereotypes about women in power and politics. She was guest-lecturing for a women's studies class, in which there were 16 women and 2 men. When she asked if they thought they'd get involved in politics, she was in for a surprise. One woman raised her hand and said, "I think I'd like to work behind the scenes. I wouldn't want to be the candidate. I tend to be sarcastic and I'm afraid people would think I was catty." Kunin and the professor pointed out the way in which the woman was stereotyping her own behavior, with no luck. Of course, there was an even better counterpoint from one of the two dudes in the room. Then, the professor pointed out the writing on the t-shirt one of the men in the class was wearing. I hadn't bothered to try to decipher it from across the table. It said, in bright yellow scraggly letters on a black background, "SARCASTIC, that's my strong point." But, you know, apparently only guys are allowed to be sarcastic in a good way. Another girl had another reason she wasn't sure about getting involved in politics. Another woman explained that it was so difficult for her to form her own opinions because there was so much information, and so many divided opinions. Her father thought one thing, her friends another, and she was caught in-between. Kunin pointed out to her that she was still young, but had another thought she left unexpressed at the time. I suspect very few men would confess to not having opinions, or better yet, would not be worried about their lack of strong opinions. Many women do not want to venture out into the "opinion world" until they are certain of themselves, the facts, and that they are right. They are afraid of being shot down. The result is often silence. If more fanatic feminists stopped trying to feminize the male community and masculinize the female community we, (this whole country and over) would be in a far better situation. You know, because gender roles are static and all women are one thing and all men are another and never the twain shall meet. And Kunin is pretty worried that if the students in a women's studies class at a card-carrying Liberal East Coast University are viewing themselves this way, it's more widespread than any of us would like to admit. To be political means to speak out, to risk being called "catty", or worse. I don't hear men worrying about whether they may be right or not. They enjoy the fight, whether it is with words or fists. Women still tend to shy away from controversy, to be uncomfortable with competition. Perhaps that is why only 17 percent of the members of Congress are female, and men are still largely running the country. 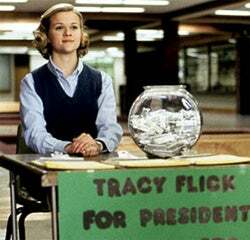 I mean, if you're a woman interested in politics, goodness knows, you wouldn't want anyone to call you "Tracy Flick" and be mean and suggest that by being outspoken or opinionated you're less of a woman. That's not the point of that kind of sexist mockery or anything, to get you to shut up and put you in your place, to keep you from being competition, to get you to quit. Better words to live by? The day in which some asswipe only calls you "catty" is a day in which you aren't being nearly opinionated enough.